he name of Barry Sheene is synonymous with Suzuki’s RG500. He helped develop it, spent most of his career riding it (1974-1979 and 1983-1984) and won 18 GPs and two 500cc world championships on it. The RG500 was raced for 13 years before being replaced by the RGV500 in 1987. It won four riders’ world titles, seven constructors’ titles, and 49 individual Grands Prix. Sheene signed for Suzuki in 1973 so was heavily involved in the development of the RG500. He debuted the bike during the 1974 season and won his first 500cc GP at Assen on it the following year. By 1976 the fast-but-fickle RG500 was well and truly sorted, to the point where nine out of the top 10 placings in the championship were Suzukis. Sheene was a brilliant rider but he also needed a brilliant bike in order to win his first 500cc world championship. This is his 1976 Suzuki RG500 in detail. The bike weighed just 134.7kg – that’s 8.1kg lighter than the bikes of his team-mates, John Williams and John Newbold. Sheene tried hard to keep his weight down to 10 stone to maximise this advantage. The rear disc was cast iron while the twin front discs were made of steel. Sheene’s bike featured factory-made calipers – just one of the tricks that helped make his Suzuki so much lighter than the others. Wheel travel had been increased an inch by positioning the lugs for the suspension struts further in along the swingarm. 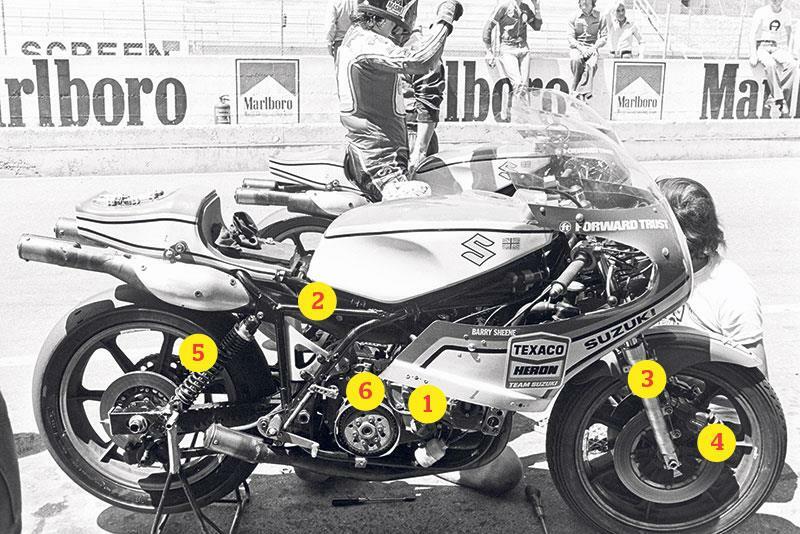 Sheene says this allowed him to ‘slam on the brakes’ later than most other riders. Early RG500s were prone to gearbox and engine seizures. Sheene came close to quitting the sport when close friend Gary Nixon suffered serious injuries after a prototype RG500 seized on him.